You’ll see them in Paris cafes clutching their blue Rick Steves guidebooks. They’re wandering the trails of Cinque Terre with their matching ricksteves.com-bought backpacks and huddled over their Rick Steves phrasebooks. These are people so loyal to the Rick Steves brand that they are known in the travel world as Rickniks, and they are growing in numbers every year. 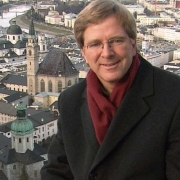 Rick Steves has been producing books about exploring the authentic Europe for more than 30 years. With the mission of broadening Americans’ perspectives through inexpensive travel, he has established himself as one of the most popular brands in the travel media industry, creating guides, producing television and radio series and organizing tours focused on cheap ways to experience Europe as a “temporary local”. By 2011, he had a business worth almost $50 million in revenue. Steves is a kind of wanderlusting Mister Rogers, promoting travel with an unrelenting optimism. This earnest spirit has hooked an abundant American audience. According to Steves’ publisher, Avalon Travel, ricksteves.com attracts more than 1.2 million unique visitors each month! Most of the people who watch his shows or sign up for his tours are over the age of 50; many of whom have never left the United States before. His fans are not Lonely Planet backpackers in search of cool expat hangouts; nor are they socialites interested in 5-star hotels and Michelin-starred restaurants. Rick Steves targets people who, if not for Rick Steves, would have likely remained apprehensive travelers, not venturing outside the U.S. This sentiment is shared by many travelers, complaining about the Rick Steves Effect – the paradox in opening Europe’s ”backdoors” to the masses. His guidebooks and shows have turned once-quaint parts of Europe into highly trafficked tourist spots. Most travelers don’t want to rub elbows with other Americans when traveling across the world. But a mention in a Rick Steves guidebook can quickly increase the foot traffic of a sleepy Swiss town or hole-in-the-wall tapas joint. When Steves taped an episode about Paris that highlighted the rue Cler as one of his favorite neighborhoods, the American tourists quickly flocked to and congested the narrow Parisian lane. It’s now half-jokingly referred to as Rue Rick Steves by some of the locals. 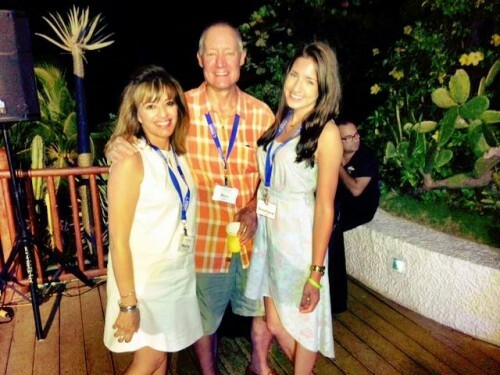 Whether these baby boomer backpackers will be the positive representatives Steves hopes them to be, or whether they’ll return home more politically and socially open-minded, is up for debate. But, as Sara Corbett wrote in the New York Times, it’s obvious that Rick Steves takes great pride and delight in the fact that he got these Americans out there travelling at all. Above: Taken from the audience in Cleveland, Ohio by Colleen on the BSW Journey. 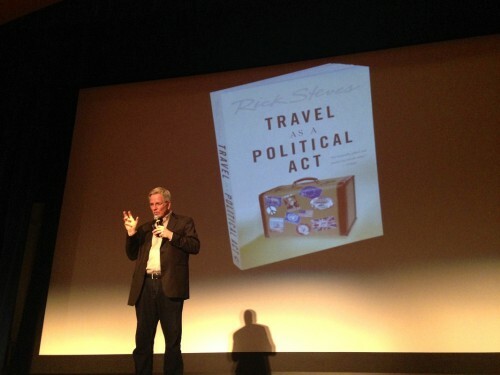 Rick was in town to talk about his new book Travel as a Political Act which tells stories and promotes travel, especially for Americans, as an opportunity to learn and better understand the interconnectedness of today’s world, and how exactly the United States fits in to all that. If someone would have told me two years ago that I would be writing a blog introducing my family foundation and voicing my opinion on next generation philanthropy, I probably never would have believed them. See, two years ago, I was an eager UC Santa Barbara grad with a degree in communications ready to make my mark in the traditional fashion/publishing industry (which I had originally considered to be my ideal career path). After having many solid internships in New York City, I had scored my ideal “dream job” working at Self magazine within the Condé Nast group a month after graduating. It wasn’t until October 2013, that I had an experience that completely and totally blew my mind. Every year, my parents co-convene this really amazing five day retreat in Ixtapa, Mexico, called the Opportunity Collaboration. 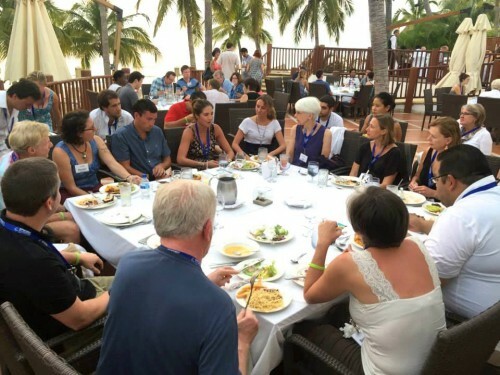 The retreat brings together world-class philanthropists, social entrepreneurs, non-profit leaders, and impact investors all around the intent to inspire people to discuss issues revolving around global poverty. I attended for my first time two years ago, not knowing at all what to expect, but was truly in awe by the incredible people that I met, the thought-provoking conversations that I had, and the exposure I gained to all of this amazing work that was being done in social entrepreneurship, poverty alleviation, impact investing, and other sectors that I was not very familiar with. Work not only being done by the “older generation” as I had previously thought, but important and impactful work being done by millennials just like myself. I didn’t know much about this new world yet – but I knew I wanted to be a part of it. Above: With my parents, Marty and Ron Cordes, during Opportunity Collaboration in 2013. Though definitely a very confusing and transformational time, with the unconditional support of my family and friends, I made the tough decision to leave my “dream job” at Condé Nast and transition into working for my family foundation full-time as Vice Chair early last year. Though I had absolutely no idea what I was getting myself into or what exactly my role entailed, I rolled up my sleeves, dove in head first and never looked back. One year later, I can confidently say that this decision has completely changed my life trajectory for the better. Along with my parents, we have a small team of millennials who have really started to run and formalize the Foundation. This includes doing everything from reviewing grant applications and conducting our own site visits and due diligence trips for both our investment and grantee partners, to developing new key initiatives, a strategic plan and building the all-around greater vision for the family. A vision focused on empowering women and girls worldwide as well as connecting, equipping and catalyzing the next generation of social entrepreneurs. Above: What a difference a whirlwind year makes! This year I not only attended, but led a discussion session at Opportunity Collaboration. We have this really unique opportunity to define where we want the foundation to go and how we really want to have impact. We have this motto of the 3C’s “connect, convene, catalyze” and for us it’s about more than just giving grants and in our case making impact investments as well, but we really look to engage with our partners and the sector at large in order to inspire others to join us in our philanthropic mission. Through this blog, I hope to inspire the next generation by not only sharing stories and examples of the work that I am involved with, but also by sharing insights into what is trending in philanthropy today. Above: The team of our Techo build and the incredible family who will call it home. One example that I would like to share, which is appropriately aligned with Colleen’s most recent travel destination, is our post-OC house build trip in Mexico City. 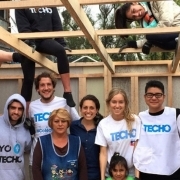 Last October, off the heels of an inspiring week of conversations and learnings in Ixtapa, a group of 10 of us highly motivated millennials decided to join Techo in their mission to overcome extreme poverty in slums through joint action, training and volunteering. For two full days, we spent time with a family and worked tirelessly building them a 162 square foot pre-fabricated module home. Through this process, there was an emphasis on not only the traditional construction of the home, but also on the construction of a link of trust between the volunteers and the community in creating a concrete, tangible, and achievable solution to poverty together. It wasn’t just about building the physical houses for people, but more geared towards empowering people to care and help others in an effort to build empathy. It was such a fulfilling and rewarding experience as I believe that empathy is extremely important, especially in the philanthropic sector, because it fosters a true sense of community and connection with the world around you and the people in it.